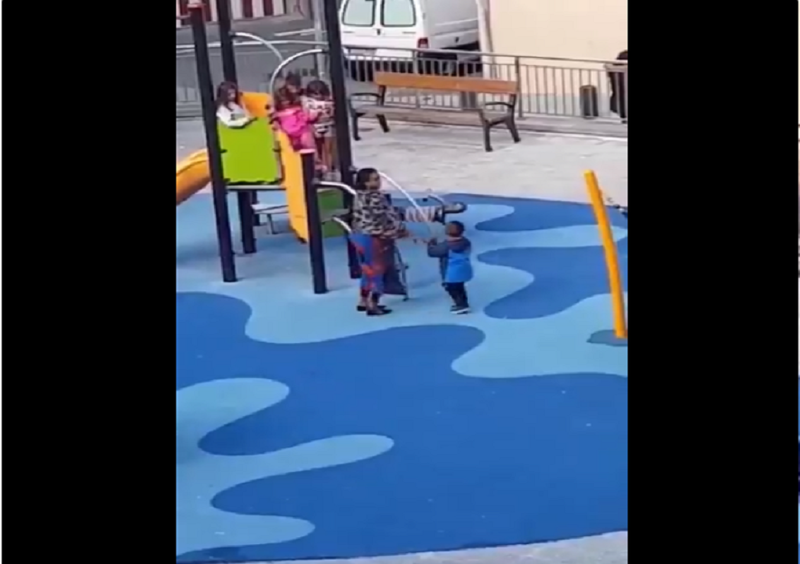 In a video which has gone viral on social media, a little black boy is seen being bullied by other children while on a playground in Spain. In the emotional clip, the child, who looks no more than 10 years old, is pushed away from the slide by the other children, upon which his mother comes and takes him to another swing. But the kids eventually walk over to his new location and begin to touch him. Again, the mother calmly removes her son, except this time, she tragically decides to leave the park all together. In the video, the other kids can also be heard chanting, MONO, MONO, MONO, MONO. These kids are shouting “MONO MONO” (Monkey) in Spanish! ALL in front of their own PARENTS!! So when people are saying they’re just curious! Are we really trying to justify their actions? ??? The clip which surfaced last week has sparked significant outrage and debate on social media. Check out twitter reactions below. And for the record, children develop racial awareness from around 6 months- age six. So save the ‘children don’t see race’ comments for an all lives matter post. I’ve heard several accounts of how overtly racist Spain & Italy are, its so heartbreaking that a child who’s life has barely begun already has to contend with such traumatic damage; its so so sad! This absolutely shocking. Other parents sat on the benches & watched that happen. That poor mother must have felt heartbroken her child couldn’t play. But every credit she remained calm with such class & dignity & walked away. Not sure I’d be so calm to the adults watching. This hurt me. God this hurts. ?????????????????????????????? Spanish people are rotten inside. I don’t think this country will ever get to a point where African immigrants won’t be attacked verbally and physically. I’ve lived there and I’ve experienced it first hand. Add your voice. How do you feel after watching this video? What are your thoughts on this? Is this racism or child’s play?